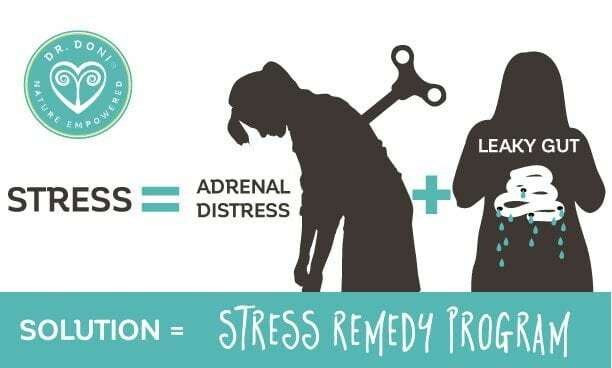 Dr. Doni explains how chronic stress leads to adrenal distress which, in turn, leads to leaky gut and how this vicious cycle causes many common diseases. Okay so I’m a science nerd. My sister told me so when I was young, but I resisted it until now. Looking back it makes sense; I spent many a teenage night studying biology and physics when other kids were learning how not to get caught at a party. Sure, I probably should have believed her when I graduated first in my class (with honors) and then proceeded to finish two bachelor’s degrees (science and nutrition) in four years but hey, I was studying science, not myself! I even started pharmacy school and, when I left to attend naturopathic medical school, my parents nearly strangled me, but with my commitment to practicing a type of medicine that utilizes science to improve one’s health using diet and natural approaches rather than prescription medicines, there was no way to stop me. You see, through all those years of studying, I came to believe that our bodies function best when given what they need, including the right foods, nutrients, sleep, exercise, and emotional care. And that when symptoms develop, it is because the body needs something it is not getting. While prescription medications are needed in some situations, wellness requires that we think bigger and understand our bodies on a grander level – a big picture view. What I noticed when I looked at the body in this way is that stresses in various forms, from psycho-emotional stresses to physical stresses and including nutrient deficiencies, elevated blood sugar, exposure to toxins, and overuse of medications, all trigger a response in the body that leads to imbalances in hormones, digestion, immune function, and the nervous system. I could see that this was true both for my body and for the patients I was helping with their health issues. When I examined this pattern over and over, I saw two (I’ll tell you about a third another day) major disturbances that occur as a result of stress on our bodies: Adrenal distress and intestinal permeability (known as leaky gut). How both of these conditions look differs for each person, but when it comes down to it, the basic pattern is the same. Each person’s body has its own unique response to stress at any moment in time (in part determined by genetics). For one person, cortisol (an adrenal stress hormone) goes high at night, while for another it goes low in the morning, or a combination of the two. Leaky gut can be mild, moderate, or severe depending on the person’s genetics and exposures to stress. But both are common patterns across most all health conditions, whether we are talking about acne, fibromyalgia, allergies, autoimmunity, or cancer. And both adrenal distress and leaky gut perpetuate each other, creating a vicious cycle of stress in the body. More about that below. When I made the connection between adrenal distress and leaky gut (back in about 2003), it fell completely in line with my vision of health and healing, and I became fanatical about telling others. You see, what I found is that when I connected the dots between how the human body responds to stress and the most common disease processes we see, I couldn’t help but write about it, speak about it, and teach patients how to use the information to heal their bodies. That’s why I invested in writing my book, The Stress Remedy. I chose to self-publish the book because I wanted to be sure I could share the information exactly as I saw it. It’s also why I created the Stress Remedy Program, and train other practitioners to implement this approach to healing. I teach classes at the naturopathic medical schools each year, travel to lecture at professional conferences, and I am developing my own practitioner training course. I’m also training newly graduated naturopathic doctors in my office, so they too can help patients in this way. It is also why I write this blog. Stress, in any way that our bodies perceive it, causes a ripple effect throughout the body, shifting hormone levels, immune function, digestion, and the nervous system. This is well established in research studies. When these systems are disrupted, health symptoms develop. The symptoms themselves are unique to each of us based on our genetic tendencies and injuries. What is universal is that, as the body adapts to stress, adrenal function becomes less optimal and levels of cortisol and adrenaline (hormones produced by the adrenal glands to help us respond to stress) become too high or too low at various times of day. This is what I refer to as adrenal distress – when the body gets stuck in a stress mode that, in most cases, is possible to recover from with the careful application of stress recovery activities and support (dietary, herbal, nutrients, homeopathics, glandulars, and more). Read more about recovering from adrenal distress here. So as the message of stress spreads throughout the body, one of the major results is something called leaky gut. This is not a leakage out of the body such as diarrhea, although some people do experience diarrhea. Rather, it is a leakage into the body. Usually, and under optimal health, the walls of our intestines are permeable only to nutrients and water. When our bodies are stressed the intestinal walls (which are much like a hose, but with tiny holes) become more permeable, allowing undigested food and bacteria to pass through the walls and into the surrounding tissue where immune cells are present to protect us from infections. When these immune cells identify what they see as “foreign” – undigested food, bacteria and viruses – the immune system sends its own stress response messages out into the body. This immune response then leads to many of the symptoms we experience, from headaches and anxiety, to joint pain and sinus congestion. Read about healing from leaky gut here. When digestion is exposed to stress, in addition to leaky gut, digestive function decreases, making it harder to digest food and increasing the effects of leaky gut throughout the body. The healthy bacteria in the colon are disrupted (known as dysbiosis) and, as they move further away from optimal, that also increases leaky gut and inflammatory signaling throughout the body. These signals find their way back to the adrenal glands, completing the cycle and perpetuating the original stress signal and adrenal distress. This is true of psycho-emotional stresses, as well as environmental stress in the form of gluten, pesticides, antibiotics, and viruses (such as Epstein Barr Virus). Overall, once the effects of stress disrupt digestion and cause leaky gut, there is a cascade of signaling, from various points in the digestive tract (from the immune system, the nervous system, and from gut bacteria themselves) reporting this stress to the brain, adrenal glands, as well as a continued signal of stress to the rest of the body. More hormonal, neurotransmitter, and immune dysregulation ensues. Toxicity, oxidative stress, and mitochondrial dysfunction become inevitable. What started with stress, whether originally perceived by the brain or the gut, has become fatigue, pain, depression, anxiety, infections, autoimmunity, allergies, skin rashes, thyroid issues, infertility, IBS, fibromyalgia, dementia, and more. This is the vicious cycle I discuss in my book The Stress Remedy, published in 2013, and it is the pattern I teach patients to reverse. By understanding how it happens, we can make informed decisions about how to change the course. We can choose different foods, ensure adequate sleep, make time for stress recovery and exercise, and by doing that we support our bodies to heal. This is the basis of the programs I developed – The Stress Remedy Programs. If you want to discover if you are suffering from adrenal distress, you can take my quiz here and get my ebook called A Guide to Adrenal Recovery, for free. If you would like some help in recovering from adrenal distress or leaky gut, keep in mind that not all practitioners address adrenal distress and leaky gut, so when looking for someone to help you, ask them if they address these health issues. While there are thousands of studies confirming they exist, conventional medical approaches don’t tend to identify or address adrenal distress and leaky gut. I offer one on one consultations via phone, Skype or in-person, if you’d like me to review your case and make suggestions. You can learn more here about making an appointment with me, or my naturopathic resident. I offer several package options to help make implementation easier for you. For example, my Total Wellness Package, which you can read more about here. Or look for a naturopathic doctor and graduate of an accredited naturopathic medical program near you. I hope this article has helped you become more curious about your body, and see that what you do each day has a big influence on how you feel and that you could feel better simply by learning to give your body what it needs – I find that such an incredibly empowering thought. Adrenal distress and leaky gut can heal and, as they do, your digestion, immune system, hormones, and nervous system can heal too. I know it can be hard to feel awful for so long. That’s why I’m inspired to help you implement, little by little, and day after day, the stress remedy approach.